China’s education system is robbing its young people of the chance to become unique individuals, a leading educationalist says. 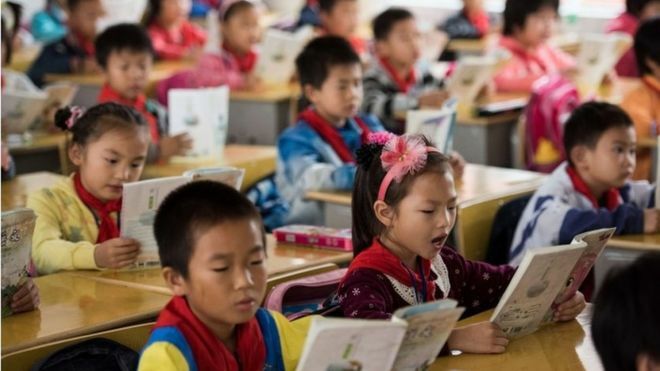 Author and academic Sir Anthony Seldon says China’s strict schooling style needs to change or its youngsters will suffer, along with its economy. Chinese schools, often criticised for rote and repetitive learning, should be more holistic, says Sir Anthony. The comments come during Chinese President Xi Jinping’s visit to the UK. In a speech at the Institute of Education on Wednesday, the president seemed to take on board some of these notions. He said, after watching a BBC programme recreating a Chinese school in England, he had realised that “the British have learned the virtues of strict discipline” from China. The Chinese, meanwhile, had been learning the advantages of recreation, he added. “Chinese children do not play enough. They should play more,” Mr Xi said. The school day in China’s state schools starts at 7am with various physical exercises. Amongst other daily constitutionals, such as Tai Chi, pupils are encouraged to massage their eyes to keep them healthy and get them ready for the day. The children have two meal breaks in the 12-hour school day and will exercise together every day – sometimes twice a day. The teaching style is focused on note-taking and repetition, otherwise known as rote learning. This is a great contrast to England’s more interactive teaching style, where pupils are encouraged to participate in class and make judgments for themselves. Chinese children live under the One Child Policy and feel the weight of responsibility on their shoulders, so there is great importance placed on their educational achievements. Good exam results are associated with social status and success and entire families can pin all their hopes on the single child. Chinese pupils learn the same subjects as English school children in the main, but are combined with practical work experience around the school campus, as well as Chinese culture, morality and ethics. One feature of Chinese schools that England’s teachers may welcome is that the pupils almost always are required to clean their own classrooms. 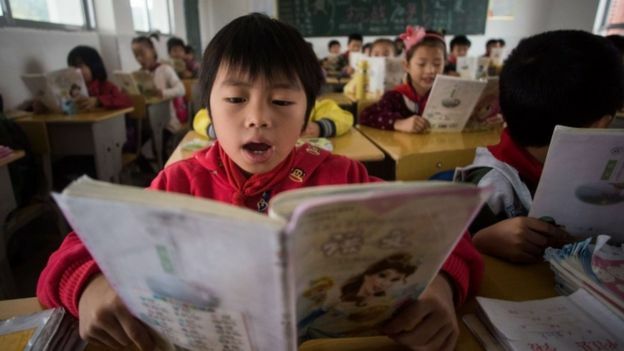 China’s schools educate an estimated 192,000,000 children – a fifth of the world’s school age children. Indeed Shanghai and Hong Kong are among the top performing districts in the world, according to the Organisation of Economic Co-operation and Development. Sir Anthony added: “It is the ‘human’ skills that cannot be replaced by computers that Chinese schools and schools worldwide need to be giving far greater focus. “Many schools are robbing the young of the opportunity to blossom into the unique individuals that they are because too many teachers think that solely cramming pupils’ heads full of facts is education. “Many education systems focus on exams being the sole validators of school, but recent research suggests that jobs with a big growth in salary have been those that require a high degree of social skills,” he adds. Sir Anthony, former master of leading private school Wellington College, is a great advocate of protecting and enhancing pupils’ well-being in order to maximise their potential to learn and express themselves confidently. Like many private schools, Wellington College has an international school in China, where it offers a traditional English public school education.